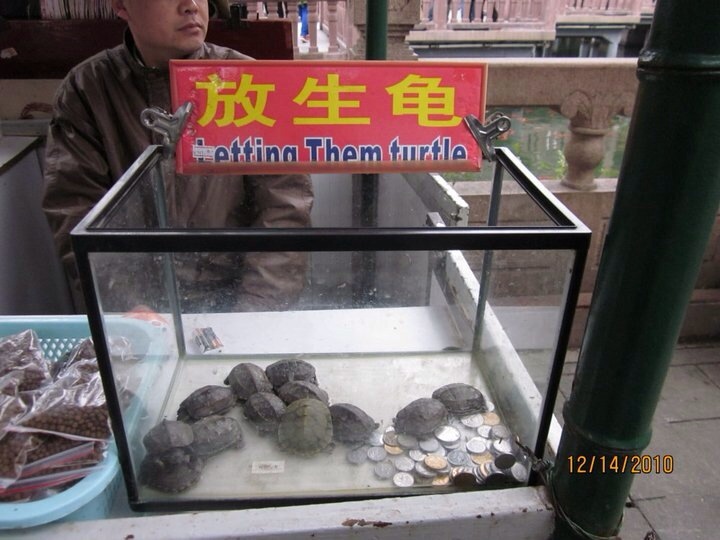 If you missed my trip to China parts 1 and 2, catch up here and here. Welcome back! I left you last with my thoughts on Chinese toileting habits and a full day of touring in the rain. 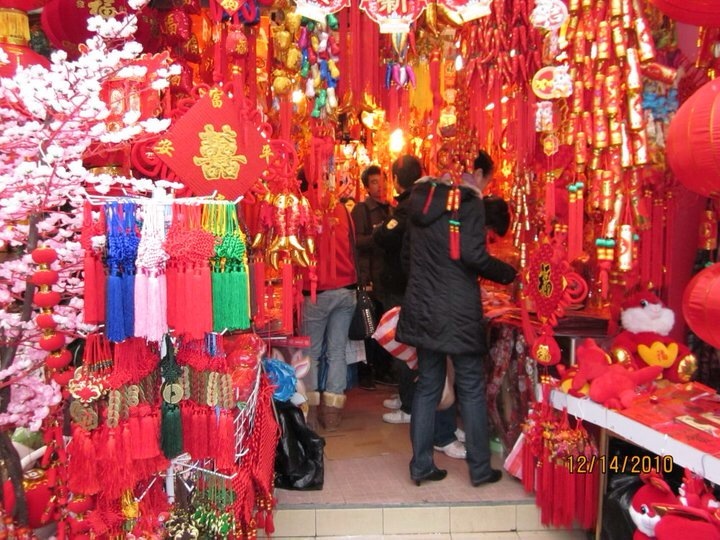 Now we return to Shanghai and a totally different experience…. first stop, breakfast. 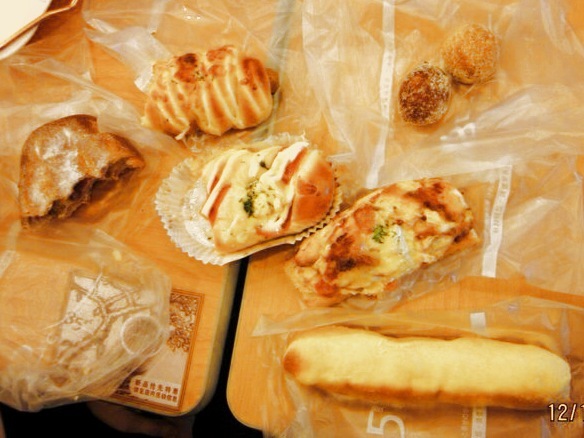 Anna and I stopped at a local bakery for breakfast on our way to YuYuan Gardens. 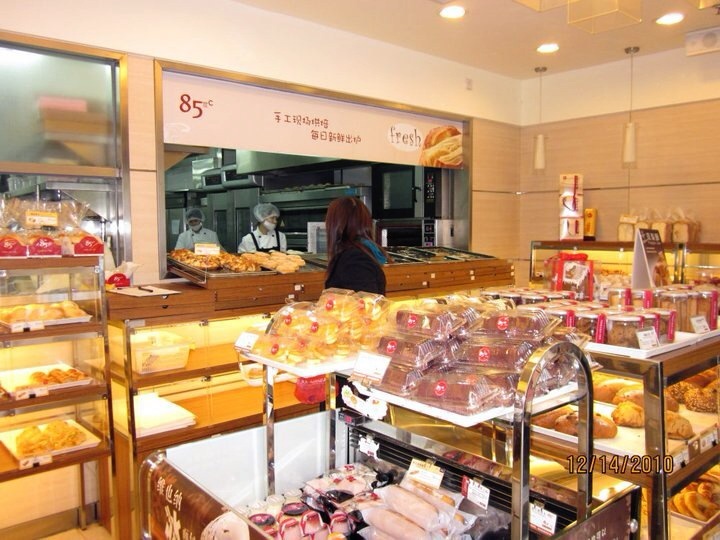 It was called 85 Degrees Cafe and is a Taiwanese chain of bakery/coffee shops. The shop was cute and was a self serve set-up, you walked through the displays and chose your pastries with tongs from their bins. I was excited and sure that I would recognize most dishes…how different can donuts and cakes be? Boy was I wrong. Anna and I chose an assortment of pastries, some of which she had tried before, like the hotdog danish thing in the middle, some of which were new to both of us, like the doughnut holes, or what we assumed were doughnut holes. 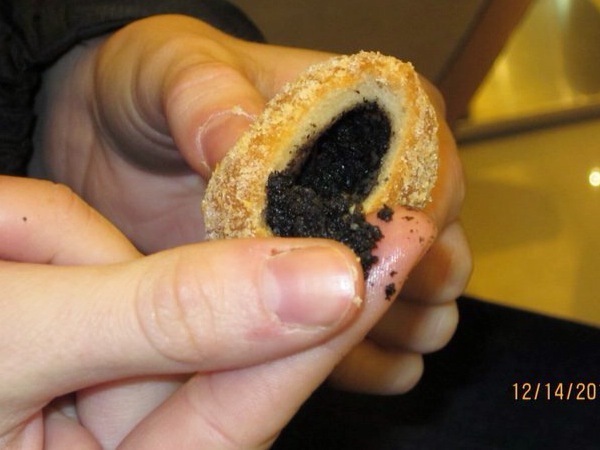 Upon tasting our spoils, we discovered that one of the pastries resembling a cheese danish was actually full of seafood (bleh) and the sure to be delicious and normal doughnut holes were actually full of an unknown substance with the exact taste and texture of dirt. I’m still not sure what that filling is….not chocolate. I’m shuddering a little just thinking about it. 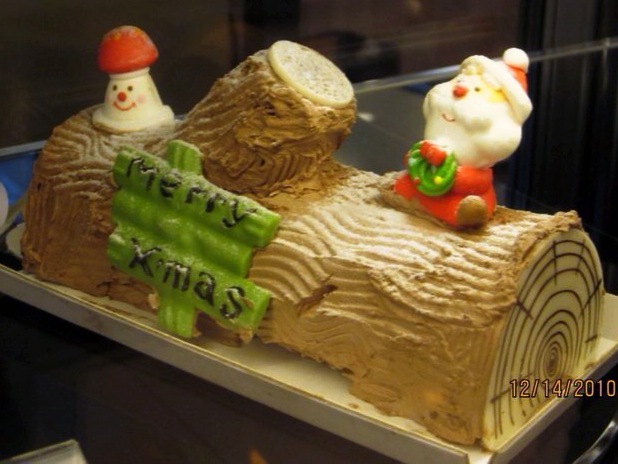 And here’s a funny picture of a Christmas cake at the bakery….I guess it’s a Yule Log? It’s kind of cute but I don’t really get the little mushroom? 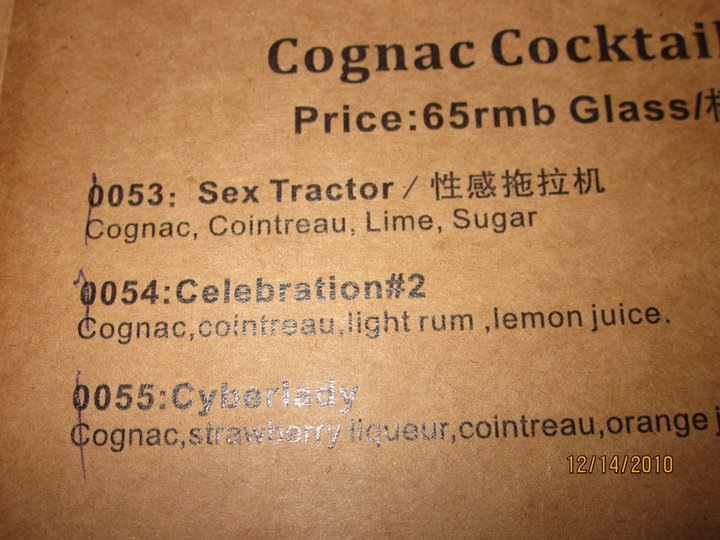 Kind of Christmas-y, but maybe not quite…I have never seen one of these in the US but they were ALL over China. 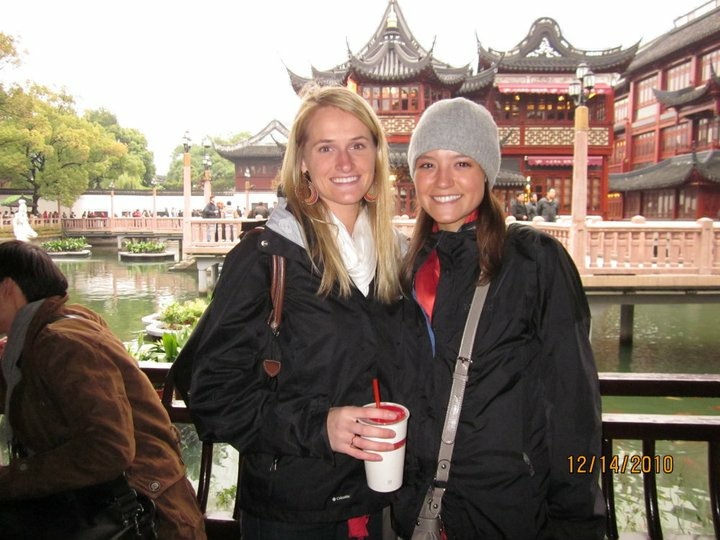 Needless to say, breakfast was kind of a bust, so off we went to Yu Gardens. 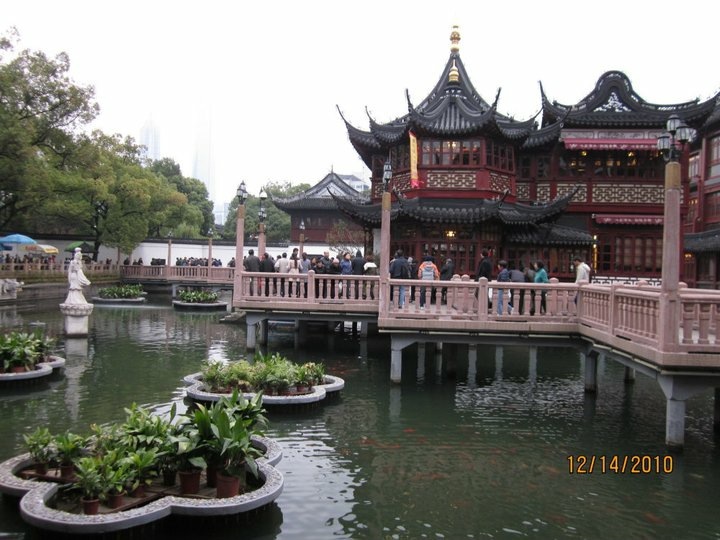 Yu Gardens means “Garden of Happiness” and is a large garden built by the Ming Dynasty in the 1500’s. 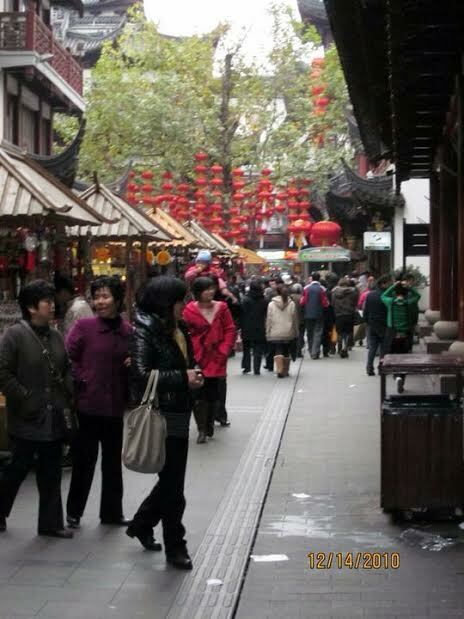 It is located in the old part of Shanghai and is one of the larger tourist attractions in the city. It was pretty in the winter when we visited and I’m sure only gets more beautiful in the spring and summer. It is full of large koi ponds with cute little boats, beautiful pagodas and temples, and all sorts of water plants and flowers. 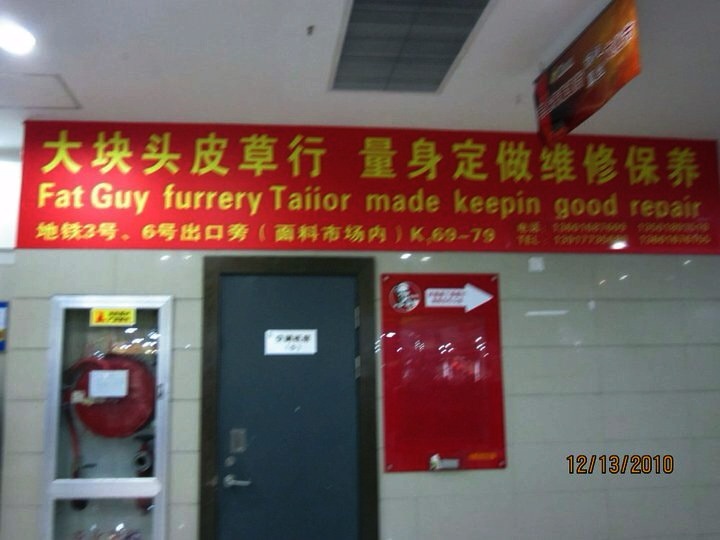 I THINK it’s a tailor that makes furry suits for fat guys….but who really knows? Someone who knows a lot more about Mandarin than me can probably provide a much better explanation, but as far as I know, Mandarin Chinese is different from just about every other language which makes it not only very hard to learn, but also clearly difficult to translate. Mandarin Chinese is a tonal language, so one word said different ways can have many different meanings, it also is not written using an alphabet, but rather thousands and thousands of characters that aren’t necessarily phonetic. It makes my head hurt just thinking about it, did I mention how smart Anna was? After touring the gardens, we shopped the market a bit. Here I bought a surprisingly comfortable pair of beaded flats which I still wear 5 years later and got my first whiff of stinky tofu. Stinky tofu is really, really smelly, and not in a good way. People love it but it was one delicacy I didn’t try. Instead, I opted for a soup dumpling. How cute are these guys? 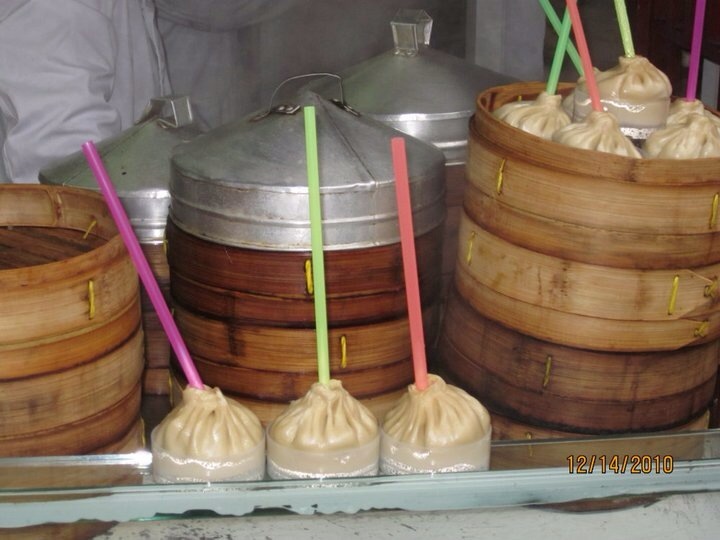 They are filled with soup that you slurp up with a straw, but be sure you poke a hole in the side to let the steam out, otherwise you are in for a very burnt tongue. After we’d had our fill of the market, we walked back to our hostel and got ready to meet Anna’s ex-pat friends for a night out on the town. After two disappointing meals for the day (remember the dirt doughnuts?) we needed a really yummy dinner. Anna’s friends, two of whom were named Bobby, took us to a small Thai restaurant that was hands down one of the best meals of the trip. Somehow I didn’t snap any dinner pictures but my favorite dish was scrambled eggs and scallions in a sweet tomato sauce. As strange as that sounds it was really delicious. It was also really cheap! Dinner came out to around 6 or 7 dollars per person, including alcohol! This more than made up for the seafood breakfast pastry and stinky tofu smells at lunch. From the Thai restaurant, we headed to the Bell bar which was right around the corner. It was a tiny bar with a really neat upstairs seating area. Our cute waitress handed us the menus and then immediately apologized that it was “Chinese English…it all wrong!” with an adorable giggle. 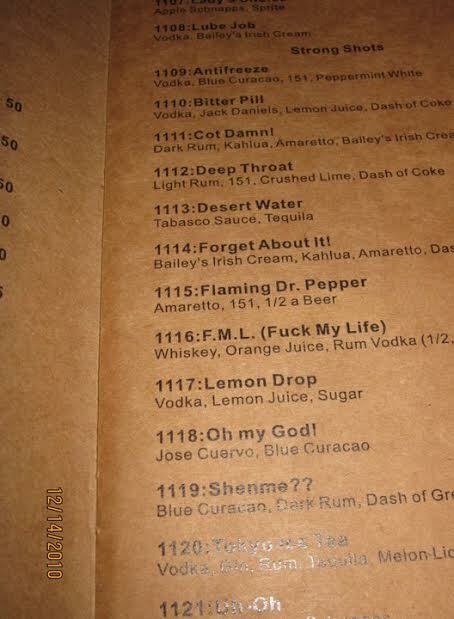 Cue hilarious and misspelled drink names…. 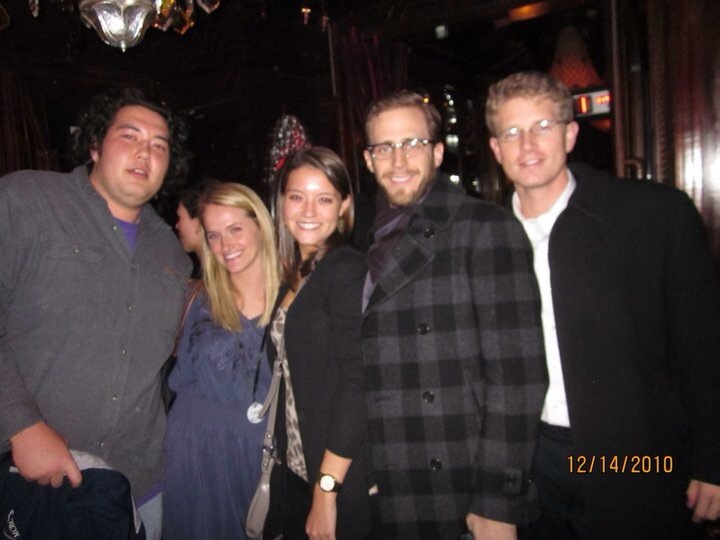 After a drink at the Bell Bar we hopped in a cab and headed to BaBa or No. 88. I’m not sure what it is with just naming places after numbers but it seems to be a trend, eh? 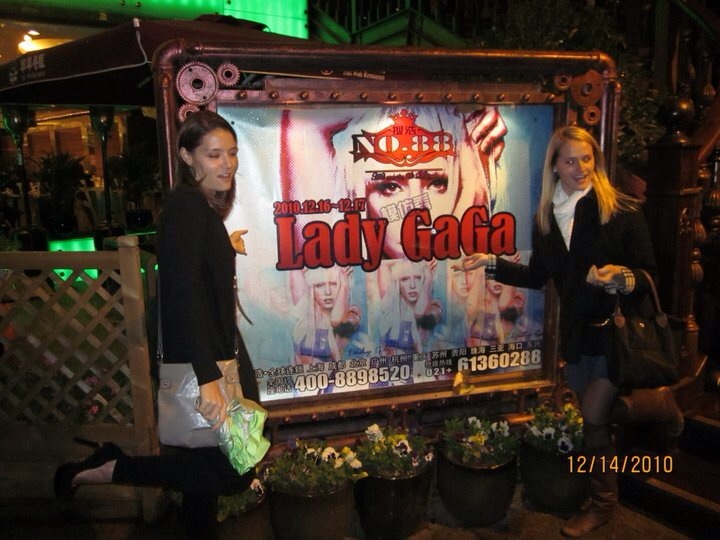 While we waited in line to get in, we noticed a billboard advertising Lady Gaga coming to play the very next night! Not only did this immediately confirm how much fun we were about to have, but it also broke my heart just a little as I was quite the Gaga lover at the time. Despite missing Gaga, the nightclub was HUGE and a lot of fun. 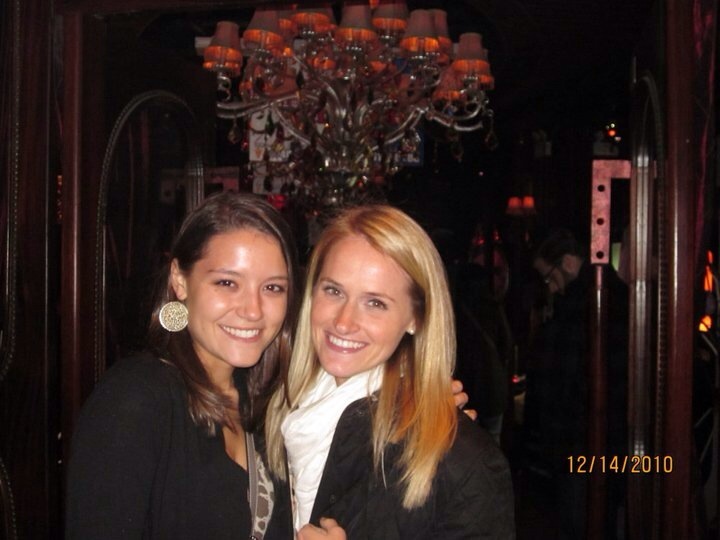 It was decorated with lots of big chandeliers and colorful lights and FULL of people in some really crazy getups. We danced our hearts out before returning to the hostel. A fun night out was the perfect end to our first few days in Shanghai, and the morning brought with it big plans, our first foray into the Chinese rail system as we traveled to Hangzhou on our way to Beijing! Stay tuned, the overnight train is not to be missed! I love the entertaining way you write. You have a gift. I love the entertaining way you write. You have a true gift.